Marcus Porcius Cato (234-149 B.C.) - Roman statesmen who perhaps was the man most responsible for the final destruction of Carthage. As a young man at the time of the Second Punic War, he witnessed first hand the carnage Hannibal inflicted on his country. In fact, he was an officer in the military, serving as tribune, and a member of the force that defeated Hasdrubal at the Battle of Metaurus. He and Scipio Afrincaus were contemporaries, but the two did not get along. Much of animosity stemmed from the fact that Scipio did not raze Carthage to the ground after the Battle of Zama. 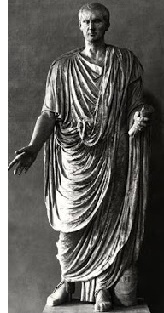 When his military service ended, Cato entered politics and rose quickly through the ranks, being elected Quaestor in 204, Aedile in 199, Praetor in 198 and finally Consul (the highest elected office in Rome) in 195. He later also served as Censor in 184. But the threat of Carthage always remained in the back of his mind. Despite being stripped of its power, Cato was worried it would rise once again and challenge Rome's supremacy. As a member of the Roman senate, he ended most of his speeches with the phrase, "Carthago delenda est!" (Carthage must be destroyed!). He died in 149 B.C., the same year the Third Punic War began. Among his many titles, he is often referred to as "Cato the Elder", to distinguish him from his great-grandson, Cato the Younger, who was also a famous statesman, best known for opposing the dictatorship of Julius Caesar a century later.